This study aimed to determine the effectiveness of Low Level Laser Therapy (LLLT), and Calendula officinalis 3cH respectively as treatment protocols on wound healing in injured human skin fibroblasts (HSF) in vitro. Furthermore, the study aimed to investigate the effectiveness of a combination of both treatment modalities on wound healing. LLLT is a form of phytotherapy, involving the application of low-power monochromatic and coherent light to injuries and lesions to stimulate healing. LLLT has been used in many experiments since the 1960s to examine the influence of laser radiation on the healing process of wounds. 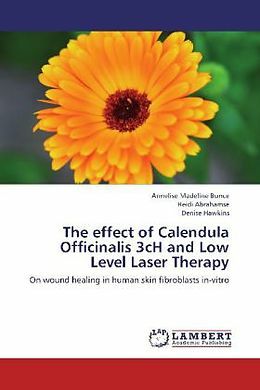 Calendula preparations are mainly used for the treatment of wounds. It is an all purpose skin-healing agent. Although only a few statistically significant differences were obtained between the measurement tools and any of the treatment protocols, it is important and worth noting that small differences in the cellular level might have a significant influence at the systemic level because of cell-cell interaction that may elicit a cascade of events. Dr Annelise Bunce is a homeopathic doctor practicing in Johannesburg, South Africa. She received her bachelor's degree from the University of Witwatersrand in 2002, majoring in Psychology and English. In 2006 she graduated from the University of Johannesburg where she obtained her M:Tech Hom.